Flexible modern cafeterias fuel productivity, one hungry employee at a time. The Deloitte University cafeteria. Image courtesy of JLL. Does your cafeteria serve productivity on its menu? Good food is only half the recipe for success in a corporate cafeteria. Communal, well-designed cafeterias are rising in popularity as spaces that deliver ROI in the form of recruitment, branding, collaboration, and productivity. Who wouldn’t feel less stressed when an informal team meeting can take place over espressos in a space bathed in natural light? Recent studies from global organizations like the World Green Building Council show that smart workplace design — including cafeterias — can reduce absenteeism, enhance creativity, and shape a more focused workforce with less stress and improved morale. A comfortable cafeteria can be a great alternate space for informal meetings, social events, and good old-fashioned chit chat. But, first and foremost, it is what it is: a place to eat. This is no minor point when you consider the time it may save an employee who would otherwise leave the building to forage in neighborhood convenience stores and restaurants. Conversely, for those who forgo lunch because they cannot risk the time to leave the building, a cafeteria provides a schedule-friendly place to get the nourishment they need for a productive afternoon of work. It also gives desk workers a reason to get up and stretch their legs. Cafeterias can support networking like the metaphorical water cooler — but on a greater scale. Accidental encounters can foster cross-pollination not just within a group, but also between departments, supporting organizational innovation goals, and adding to a sense of community. For example, one of JLL‘s law firm clients noticed that its associates were frequenting a coffee shop across the street from the firm — not just to pick up coffee, which they could have gotten from their convenient, but sterile, in-house cafeteria, but also to sit and work, sometimes alone with a laptop, sometimes in small groups. When the firm took the cue and created a lunchroom that captured the feel of the coffee shop, the change inspired many associates to keep those conversations and work sessions in-house, saving time and creating opportunity for more dialog with the rest of the employees. Beyond coworkers, when clients and out-of-town colleagues have the option to eat in the in-house cafeteria, they too can find value in minimizing disruptions to their business and informal networking. A smart layout is the first ingredient of a successful cafeteria redesign. The most effective eating/networking spaces allow plenty of room to walk freely and offer flexibility to move tables and chairs “on the fly”. Flexibility can come in the form of movable walls to varied lighting, seating alcoves, and even space that extends outside or into smaller, more intimate settings. Next up is lighting — natural, whenever possible. Strategic lighting can help define the different uses of space. For example, bright lights in the communal tables area can be energizing, while softer lighting in lounge areas can create a more relaxing mood. Views of plants, whether indoor or outside, tap the natural human desire for connection with living things. Easy wireless access and lots of outlets for power are crucial because people will only be able to work there as long as their laptop, tablet, and mobile phone batteries last. This element is often forgotten in the planning stages. And pleasant (not distracting) background sound rounds out the must-have list of environmental elements. Finally, re-branding the cafeteria can have a dramatic impact on how employees perceive the space. The term “cafeteria” has very established connotations, some of which may not be a positive representation of a space designed to increase collaboration and productivity. By creating a new, compelling term to more accurately represent the space, employees will be encouraged to use and collaborate in the space. In the cafeteria at the Deloitte University campus in Westlake, Tex. (pictured at top), flexibility and quiet reflection were both key goals. The new cafeteria incorporates mixed-media throughout, from picnic tables, individual counter seating, and movable club chairs to windows, ambient lighting and droplights. The cafe at Pizza Hut’s corporate HQ. Image courtesy of JLL. 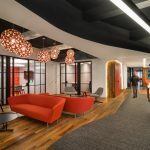 More than a grub hub for employees, Pizza Hut’s corporate headquarters’ cafeteria also serves as a brand builder and gathering place for employees, clients, and others. The brand palette plays an important thematic role across the design, from the furnishings and décor to the red-and-white round ceiling light and the ceiling itself. Plenty of approaches can be used to transform the dreary, sterile cafeterias of yesteryear into dynamic settings that engage employees, boost wellness and productivity, and enhance the corporate brand. The most important consideration is to design a cafeteria that matches your organization’s culture in every wall, fixture, and… sandwich. Previous articleBecause Who Doesn’t Need an Acoustical Cactus? Thanks for the great article about cafeterias. It is always interesting for me to learn about different topics in the world. It really seems as though inside of the food industry and food world there is an entire topic in it, cafeterias! Although I don’t know much, it seems fascinating and something that I want to learn more about. This article did a great job of shedding light into the day to day operation’s in cafeterias and what is lacking in their world. Thanks again for sharing!